In this article I am presenting the Edu-Mobile – An idea and concept to have a mobile phone designed for learning in the Majority World. This is all fantasy – my dream. I am closely following the One Laptop Per Child, also known as the $100, $130, $140, $150, $ 176 laptop, project. The OLPC news is a great independent media for this. I have been critical about the OLPC / $100 laptop design process and also about the (lack of) implementation /sustainability / business models. The design of the OLPC laptop has not been contextual and/or human centred. If something, in this kind of initiative one should have a human-centered computing approach. I also have claimed that for the Ministries of Education, the investment made to OLPC program is not necessary very good one. It does not pay off, if the bottom line is improvement in learning and education (as it should be). In the OLPC news there is right now a lot of discussion and worries on how the Ministries of Education may finance the purchase. Also OLPC news are pointing out the lack of implementation plan and some earlier failures of similar initiatives (even from the same people). There is competition, too. There is the Intel’s Classmate PC and Quanta Computer is planning to produce a retail version of the OLPC laptop that will cost $200 and be for sale in the emerging markets. This is all good and important, as the computer technology is getting more affordable. However, I think one should not think about PC when designing educational technology for the rest of the world. PCs are far too complicate technology for most people. We, who are sitting 6 to 20 hours a day in front of one, may feel that PCs are simple and very empowering. They are, but they are that only for us. So, I think the edu tool for the rest of us should be something else than a PC. In several occasions I have said that the Apple i-phone and the Nokia N800 Internet tablet are the most interesting new devices for school, education and learning. Both are, first at all, Internet clients with WLAN, web browser, RSS-reader, media player etc. These all are important features for learning and with web 2.0 services one could pretty much survive only with these. However, the prices – i-Phone 499USD and Nokia N800 399USD – will, exclude them from the emerging markets. The Edu-Mobile is a basic mobile phone with some additions. 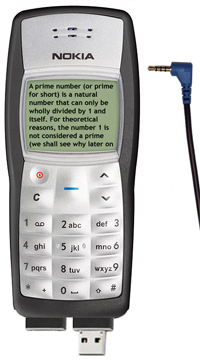 It could be based on the Nokia 1100, which is sold over 200 million units. It is a design classic. Educational and community FM radio could reach millions of listeners. In most parts of the world there is already a lot of radio “know-how” and infrastructure. This would make the implementation economical. e-books could be distributed with the USB, from one phone to another – in schools from teacher’s Edu-Mobile to the students Edu-Mobiles: School books, novels, manuals, news. With the USB one could also print stuff from the Edu-Mobile in a corner shop or to attach a keyboard in to the phone when writing some longer story. The wiki and blog reader/writer applications would bring the basic mobile phone users to the read and write world – to the world where we are the media. This of course requires that someone will be hosting wiki and blog sites for the Edu-Mobiles. The e-book reader should be very simple and light. This means plain text – maybe some simple graphics. The blog/wiki reader/writer should be able to interpret the standard installations of MediaWiki and WordPress. In MediaWiki site it should show you the “discussion”, “edit this page”, and “history” commands. In WordPress the “write” command should be easy to reach. At the moment the consumer price of the basic mobile phone models is something like 30-40 USD. With the add-ons for education the price should be close to 50€ USD. The sustainability / business model is simple: People will see the value of the Edu-Mobile and will purchase them (someone should make some market studies on this). In the Majority World the Edu-Mobile should be “marketed” as the mobile phone that will help its owner to educate herself and to become successful. If the “edu-features” of the phone do not finally help in this, there are still the mobile phone features, which every person in the world have found useful in their daily life. Where the Edu-Mobile idea comes from? It comes mostly from the MobilED project. In it we have made contextual inquiry, participatory design, product design, and software prototype exercises to find out how learning environments could be enhanced with mobile technologies and services. For the developing world, one must also have bluetooth (and a camera). I just got back from Morocco, where all the craze is swapping videos via bluetooth. Its peer production, but totally decentralized. Appareantly the same type of phenomena is current in South-Africa. Roope, See the list of the Least Developed Countries: http://en.wikipedia.org/wiki/Least_developed_countries…Morocco is not LDC, neither South Africa, though millions of people in these countries live in LDC conditions. Thank you for the classification. I guess your point is that we need something far more simple for the poorest regions?